The term ‘disruptive innovation’ is everywhere. Although the term is overused – read this article in which Harvard professor Clayton Christensen who originally coined the term disruptive innovation explains why Uber is not a disruptor but Netflix is – we live in times in which startups and behemoths alike are actively looking for ways to shake up entire industries and they often succeed. As we use disruptive digital technologies, we sometimes blur the boundaries between our physical and virtual worlds. One example is getting a mortgage loan. Years ago, that required multiple trips to the bank and lots of paperwork, but now you can handle the entire process online from your couch. Many years ago, I was travelling the world as a ‘digital nomad’, a term for someone who works remotely while travelling. One friend called me a homeless freelance programmer instead, in an attempt to make me feel less hip. In the morning I was coding under a palm tree at the beach. 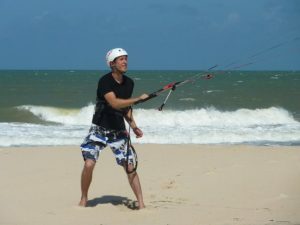 In the afternoon – once the wind picked up – I was kitesurfing. Now, years later, my wife and I order groceries online. I still collect them with the car, but I expect they’ll be delivered soon enough. We also get dinner boxes with recipes delivered to our door, allowing us to eat vegetarian twice a week without any effort. Half the week I work remotely. We have huge electronic mailboxes in which shipping companies can pick up or drop off any package using a pin code without ever seeing us. All these conveniences help free up time to raise our twin boys, Michaël and Daniël. Thanks to technology we can pursue lifestyles that were not possible before. I love technology; I’m what you might call a gadget freak. My wife has said to me more than once, “Oh, you are not going to buy the latest version of ? I’m surprised.” I believe every technology is worth inventing and makes us better at solving problems. But what is lost by taking away all this human interaction? Some time ago – it was in the middle of my digital nomad years – I created some language learning apps. Originally, they were not intended for others to use, because I was travelling in South America and I created the apps to supplement my Spanish and Portuguese language learning. They covered all the basics – vocabulary, phrases, grammar, verb conjugations – but I never imagined they would reach over 2 million downloads in the App Store. Suddenly I had a small language learning business without knowing much about language learning. Sure, learning languages has been a constant in my life. I was born in Belgium near the French-Dutch language border, and as a Dutch-speaking teenager, I had to know French. I had to attend university in English; I started travelling after my studies, for which I learned some Spanish. Later, I ended up working in Brazil, where I had to learn some Portuguese. Some years ago, I was working with companies in Belarus and Ukraine and I had to learn some Russian. But I am not a polyglot; my track record and language skills are very common. I began to receive positive feedback on the apps, but I was also getting frequent emails that said, “Your app does not provide any guidance on learning this language. What do I need to do first?” I politely replied that, as the app description clearly mentions, it is designed to support people taking language classes, not people who are learning a language from scratch. The group of my first week at ECELA Lima. When learning a language I always attended language classes or had a private teacher. French and English I learned at the Onze-Lieve-Vrouwecollege Halle; my first Spanish and Russian I learned at the CLT in Leuven. 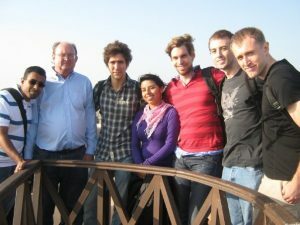 I continued learning Spanish at ECELA in South America, in Lima, Cusco and Buenos Aires. Portuguese I learned with a private teacher in Brazil. The app users writing in had a point, but their messages made me wonder whether they were expecting to learn a language just by using an app. Apps are excellent tools for augmenting learning, and they are often inexpensive to purchase. Lack of access to education is a serious driver of inequality in many countries, and it’s a noble goal to bring free or low-cost education to the world through a digital platform. I’ve tried many language learning apps myself. Duolingo and Busuu are two of them; I love the gamification and interface of Duolingo, and I really like the peer review of speech in Busuu. But when it comes to my memories of language learning, I remember the real life experiences more vividly and fondly. My high school French teacher made us think about much more than French alone. He facilitated discussions in class that made each of us think about politics and helped build our view of the world. I remember the Spanish lessons at CLT with Rita, our wise and funny teacher who lived for years in Barcelona. And I remember the Wednesday evenings after the class even more, as we found ourselves in Villa Ernesto, a bar here in Leuven, at 2am and still having to work the day after. I remember the thrill of total immersion courses at ECELA and making my first South American friends there. I remember attempting to speak Spanish in the Amazon region and getting compliments for trying, and a girl trying to teach me Portuguese when I arrived in Brazil. When I tried in my best Portuguese – which was mostly just Spanish – she replied: “Sergio fala Espanhol! Que precioso!” My name is Steffen, but according to this girl, I was suffering from dual personalities (Sergio being my somewhat manly side). But when learning online, there were no Brazilian girls making fun of me. There were no anecdotes, no 2am meetups, no stories. Languages are about interacting with others. Whether you learn a language from a teacher or through self-study and interacting with native speakers doesn’t matter. But let’s not take the stories away. Let’s not expect an app to teach us a language without getting other people involved. Through Linguineo, my wife and I are creating language learning apps that we hope will facilitate more human connections. We recognize and love the potential of technology, but we want to walk the thin line between analog and digital. We want to bring people and technology together. Saving time on grocery shopping is a wonderful convenience, as are flexible work schedules and apps that help you learn vocabulary faster. 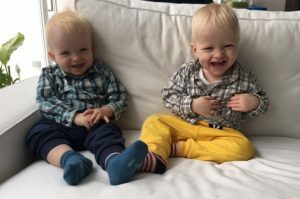 But like Foer, I sometimes “worry that the closer the world gets to our fingertips, the further it gets from our hearts.” We want our boys to be able to venture out into the world and have the same types of experiences as their parents did — real, not just online — and even better. This entry was posted in Background and tagged Background, Ideas, Linguineo on September 7, 2017 by Steffen.